Nathan, Sara’s nephew, gave this to Kathy for Christmas. It’s supposed to emit negative ions that naturally refresh the air. We’re open to that notion. 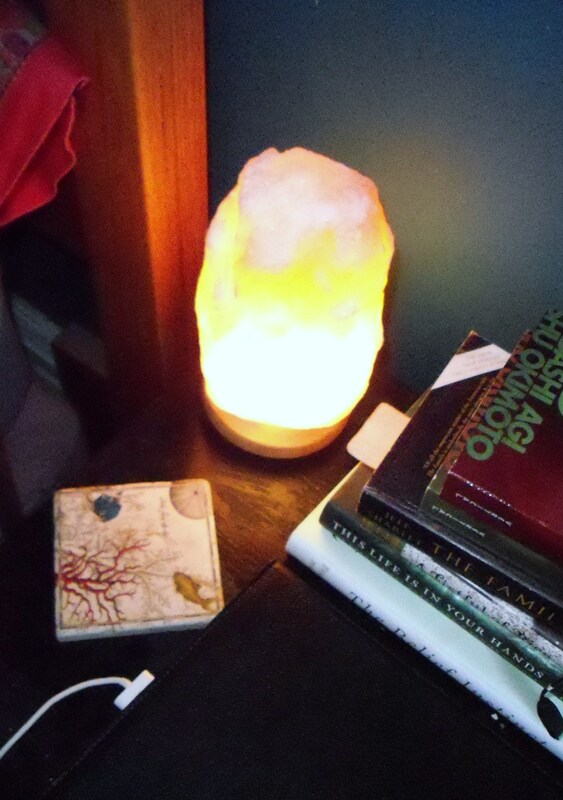 This entry was posted in Sara's Photo-a-Day Project and tagged air freshener, air purifier, health, himalayas, home, life, negative ions, photography, photos, postaday2012, salt crystal lamp. Bookmark the permalink. Thanks Robin. Sara is enjoying all of your comments. Ha, we’ll get you one for a wedding gift. It gives of off a warm glow. Thanks for taking a look! Yes, you’re so right. The glow is glorious. And the lamps themselves are incredibly heavy, but then they are made of rock. Glad to hear you enjoy yours, Dana. I like the warmth. Shoo unfresh air! That’s right. Stale air be gone! Great lamp. I like the new layout. Thanks, Deb. Glad you like the new format. I’m still playing with it. Thanks, Terri! It was a great gift. Good for you. Do you find that they bring better energy into the space? I don’t know a lot about crystals, to be honest, but we are enjoying the warm glow. I find that they help stabilize the energy present and remove negative energies that tend to creep in. They also physically help “clean” the air by releasing positive ions (and neutralizing negative ions). Cool. I’m going to have to go look at the literature that came with the lamp, as I think it said they release negative ions. I thought that sounded a little backwards. Thanks for clarifying that. Thanks, D! You would think the positive ions would be better than the negative ones. I learn something new with everything I post. Love it. Very cool looking lamp! What’s the story with the map coaster with the fish swimming at the top? We got the coaster as a gift from one of Sara’s staff when we were living in Haiti, I think. It’s interesting how negativity can create positivity. A good thing to remember. It is nice to meet the world through Sara’s eyes here. Thanks, Kath. Sara is enjoying all of the comments. I think she’s beginning to get a taste of why I love blogging so much. Ha! She’ll soon be hooked, too! I think she already is, to be honest! I feel refreshed just looking at the warm glow. We’re really enjoying it. It makes a perfect night light beside our bed. I’m enjoying Sara’s photos. I hope if you end up overseas in some cool and exotic place, that Sara will keep posting the photos. I hope the exact some thing. She says she will continue. We’ll see if she is actually able. I suppose she will find a way.